Kawaguchiya Kinosaki Riverside Hotel has long striven to bring the best service and quality to our guests. 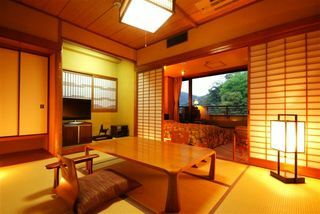 Kawaguchiya started as a humble 5-room ryokan in 1916 and overcame the great Hokutan Earthquake of 1925. The inn was then rebuilt in its original location along the Otani River near the center of town, and this is where Kawaguchiya’s main building is still located. In 1974, Kawaguchiya Kinosaki Riverside Hotel, the annex of Kawaguchiya, was built. 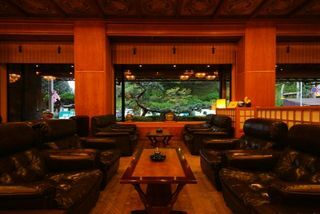 This 6-story reinforced ryokan style hotel features warm wooden interiors, a spacious lobby, a karaoke room, a night lounge, and open-air Japanese style baths that can be rented for private use by our guests. Stay in one of the beautifully designed Japanese style rooms or if you prefer sleeping on a bed rather than a futon, ask about one of our Japanese-western rooms. When making a reservation with us, don’t forget to book a Japanese style dinner. You will be served a beautifully arranged full course Japanese style dinner made with fresh seasonal ingredients, much of which have been grown or caught locally. Our menu is based on the seasons and includes dishes such as snow crab, top brand Tajima beef and freshly caught seafood. To assist our international guests we have English speaking front staff members that can help you with any questions you may have about your stay. Spacious lobby with plenty of seating, a small cafe and a souvenir shop. 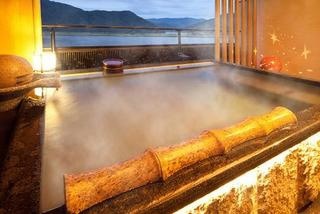 Enjoy our natural hot spring baths and dry sauna, or go into town and tour the 7 public hot springs. 5 min walk to the closest onsen. One of our Japanese-western rooms. Enjoy the view of Maruyama River from your enclosed veranda. One of two private open-air baths that can be rented for 40min for an additional price. Views of the garden can be seen from the comfort of the bathtub in our rock hot spring bath. 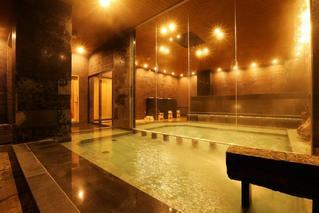 Enjoy bathing in the hot spring waters of Kinosaki, let them warm you all the way to your core. The men's and women's sides of the bath change in the morning and evening.